The Steinmatte laboratory of European Graduate School overlooking the idyllic village of Saas Fee, Switzerland. There is an authentic irony to the topography of the European Graduate School (EGS) in the Swiss Alps overlooking the idyllic car-free village of Saas-Fee. 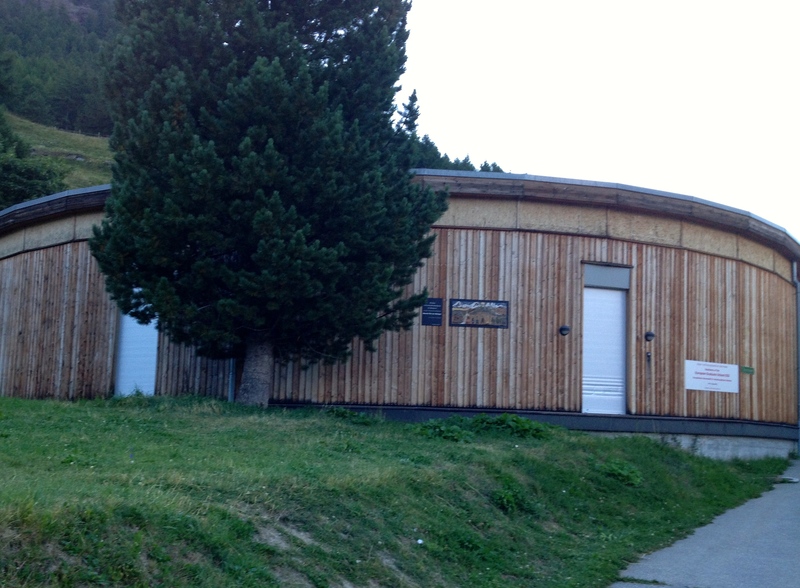 The laboratory was established in 1998 to incubate Dr. Wolfgang Schirmacher’s pioneering field of Media Philosophy; that the director lured Jacques Derrida, the founder of the French deconstructionist to the mountain to lecture to a handful of early students is Saas-Fee legend, as is the death Theodor Adorno, founder of the Frankfurt School, in Visp, the disembarkation point for the contemporary philosopher’s alpine trek into a new constellation. 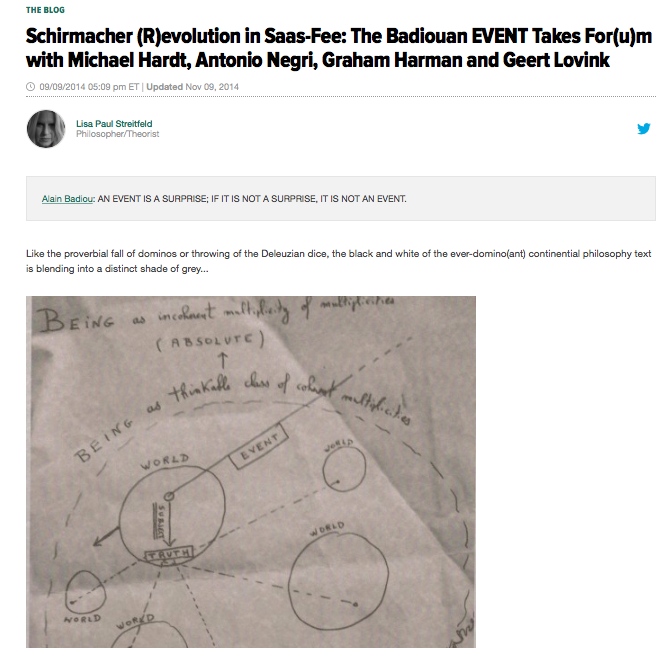 The stars did come out for the occasion: Slavoj Žižek (Slovenia); Giorgio Agamben (Italy); and Jean-Luc Nancy, Jacques Rancière, Alain Badiou and Jean Baudrillard (France). And there too arrived the protégées of the European masters: Jacques Derrida (Avital Ronell, Christopher Fynsk, Geoffrey Bennington and Laurence Rickels) along with his son, Pierre Alféri; Jacques Lacan (Anne Dufourmantelle); and Michel Foucault’s last assistant (Thomas Zummer). 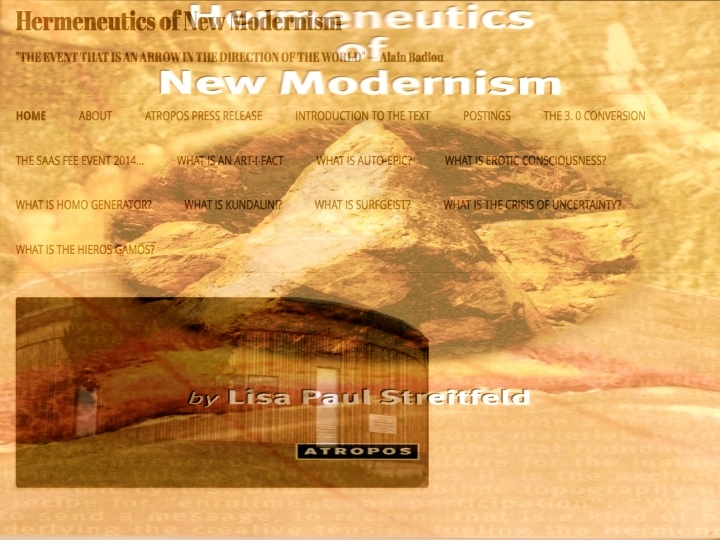 There was also space made for radical breakthrough: the American gender theorist Judith Butler and the Israeli artist/psychoanalyst/theorist Bracha L. Ettinger, whose M/Other Matrix theory inspired the popular film franchise, and more importantly, delivered the exiled feminine into the western philosophical tradition. There were innovators in the creative disciplines such as film (Peter Greenaway, Mike Figgis and Robert Bramkamp), literature (Judith Balso, Chris Kraus,Hélène Cixous and Jeffrey Eugenides) and visual art (Alessandro De Francesco). 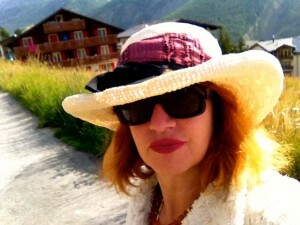 Saas-Fee is the laboratory that birthed the media phenomenon known as Slavoj Žižek, a founding EGS professor whose comeraderie with Alain Badiou was the launching pad for the Slovenian philosopher’s revival of German idealism, thereby bringing continental philosophy into mainstream global discourse. Yet, the authentic irony immediately distinguishing Saas-Free from the contrived irony of postmodernism in its death throes was not in the wide range of personalities gathering there, but the topography itself. Any short trek through the Swiss Alps will confront the wanderer with mystical symbols and signs embodied into the mountainous landscape; the gnome faces and witches leering out from their carved homes in rough hewn fences or trees are continual reminders of what has been left out of German idealism: the primordial energy. This occult shadow was so huge that it gave birth to the dark forces of the Holocaust personified through Hitler’s Hindu priestess and thirteen astrologers. This entry was posted in Uncategorized on October 26, 2014 by Dr. Shiva Lisa Paul.